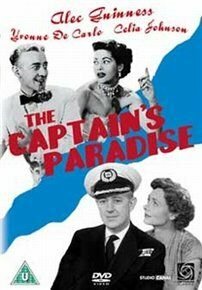 British comedy starring Alec Guinness as Mediterranean ferryboat Captain Henry St. James, who believes in the notion of 'a girl in every port'. For Henry has a wife on both sides of the water. There is Maude (Celia Johnson) in Gibraltar and Nita (Yvonne DeCarlo) in Tangiers. Everything is perfect as long as neither woman decides to visit the other port.